We all know that Lean must be led from the top. That means we must engage top leaders and convince them of the merits of Lean – REAL Lean. Progressive leaders might listen, but have you stopped to think about how business traditionalists view Lean management and its advocates? Business traditionalists are people who believe that companies exist to make a profit; maximize shareholder value (extractive finance); that capital must win and labor must lose; human potential is limited; scale reduces costs; technology drives competitiveness; the short-term is what matters most, and so on. 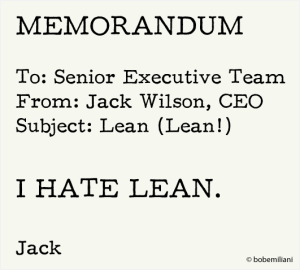 Business traditionalists hate Lean and dislike its advocates. Why? Because we believe that companies exist to serve customers; be profitable; create shareholder value (constructive finance); capital and labor must both both realize favorable outcomes; human potential is limitless; scale increases costs (and flow reduced costs); technology, carefully selected, improves competitiveness; one must never sacrifice the long-term for the short-term, and so on. Lean requires a revolution in thinking and practice. Business traditionalists don’t like revolutions. Revolutions are not welcome. So, they conduct counterrevolutions to retain and reinforce business traditions that they value. The investments made in business thinking and practice are redoubled and closely guarded to prevent liberation. Lean people view themselves as egalitarian, seeking to free people from constraints that lead to inequality and reduced opportunity in the workplace. Business traditionalists view Lean people as elitist, possessing strange ideas, patronizing, and bent on making them to take on big projects: Lean transformations. Big, enterprise-wide projects are seen as costly and unlikely to save much money. Lean is seen as having cultural roots in Japan, which fails to inspire curiosity or commitment among western business traditionalists. The question becomes, then, how can Lean advocates challenge business traditionalists in their support of traditions that exalt money (the result) and instead support a new tradition that exalts people and processes, which will, in turn, yield the desired (if not better) financial result? And, Lean advocates must do so while being aware of their own thinking and practices and how these are viewed by others. Both want to make money, and, in fact, desire to earn money rather than take shortcuts, lie, or cheat to make money. Both see a need to be serve customers and be responsive to their changing wants and needs. People have a innate desire to question their work and improve. Leaders, like workers, want to improve and develop their capabilities to higher levels. They value hard work, individual responsibility, and autonomy balanced with teamwork. They believe incentives can shape individual behaviors and business outcomes. Both traditionalists and Lean leaders are concerned about bureaucracy and its affects on costs and the quality of information conveyed up and down the organization. Technology is a very important feature of business today and in the future. They recognize that problems are inevitable and seek to correct problems. They rely on human creativity and innovation to create new products and services, which also command higher prices and larger profits. They believe in free markets; open and fair competition. They want to grow the business. Both have high regard for tradition. In most cases, it is a matter of degree and methods. This gap can be closed by doing what Lean people always do: set a standard and work towards achieve it in PDCA cycles. Business traditionalists are comfortable creating winners and losers, despite the fact that creating losers in the process of creating winners generates myriad new problems that affect teamwork, costs, quality, and time. Management’s obligation to help others, be it employee, supplier, customer, or community. In Lean, a supervisors role is to train and coach employees and engage other stakeholders in joint problem-solving. Business traditionalists view this as unnecessary and creating dependencies that cannot be fulfilled on a sustained basis. So they have a minimalist, or laissez-faire approach to the management and development of human resource: everyone is on their own. These two differences are significant and the gap between business traditionalists and Lean must be closed. Non-zero-sum outcomes are at the core of Lean management, driven by the “Respect for People” principle. A laissez-faire approach to management is not acceptable. Management must actively teach and guide employees and others to build capabilities in self and others. It is possible these two differences are irreconcilable, in which case they are deal-breakers for business traditionalists, and Lean management will be relegated to permanent minority status. In time, views among business traditionalists are likely to change and the merits of non-zero-sum outcomes and management routines that develop self and others will become obvious. The day where non-zero-sum outcomes and managers role as teachers are seen as core elements of good leadership and good business practice could come sooner rather than later. However, business traditionalists will have to come to this realization on their own.